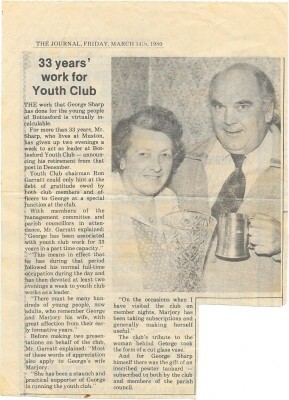 Attached is a newspaper cutting from 1980 talking about the retirement of George and Marjorie Sharp. The article describes their service to the community. They were living on the square in the late 1950s and early 60s. I haven’t seen much mentioned about the youth club, there must be many who spent there formative years there. 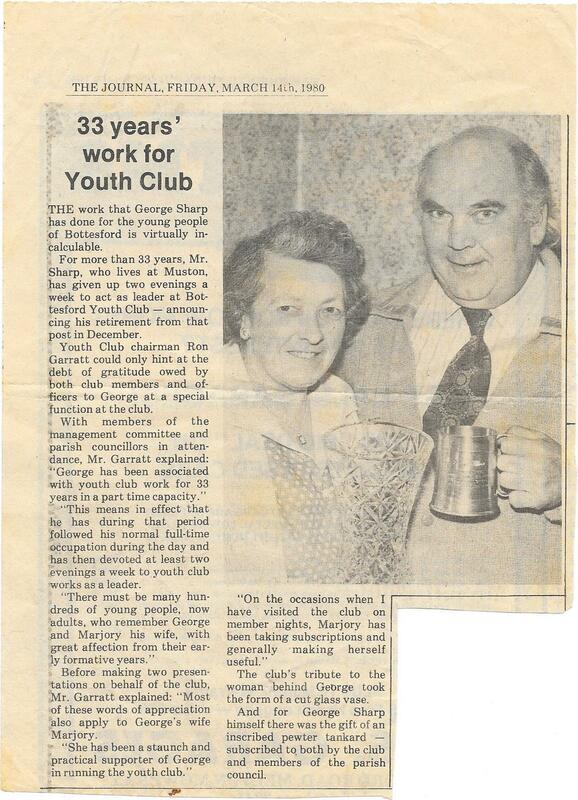 Many thanks Graham the newspaper item on George and Marjory Sharp’s support of the Bottesford Youth Club. You are right. There is much more to be recorded about the history and contribution of the Club to village life. Thank you for reminding us. That picture in the journal is just how I remember them. Marge with her knitting, and George with his big cigar, who used to let you get away with stuff; so long as you didn’t push it too far. I have many fond memories of Bottesford Youth Club, and attended twice a week as soon as I was old enough. I attended the youth club, must have been the early 60’s, Friday evenings, if I remember rightly. We had the Leicester police give an exhibition of Judo skills one evening. Many of us attended Judo classes at Belvoir High at the time. A volunteer was asked for, to have a bout with one of the police. Guess what, I was pushed into the middle of the mat!! The copper was a man mountain and me at about 14yrs/15yrs old at 5ft 6in and 10 stone didn’t stand a chance. I had a good go at him, but, after I surrendered as he was strangling me, he was full of praise for my efforts and wrote a letter to my instructor recommending me for an award of the white belt. Never forget that one. Not many people fought a policeman and been praised for their efforts afterwards.